In recent years, the US has witnessed multiple outbreaks of vaccine-preventable illnesses, including pertussis (whooping cough) and measles. In the same time frame, vaccine refusal rates have gone up, and an increasing number of parents are requesting modified vaccine schedules that differ from the one recommended by the American Academy of Pediatrics (AAP). The majority of parents do have their children vaccinated on schedule. It’s a small number of parents who refuse all vaccinations for their children. A slightly larger minority want their children to receive some but not all vaccines or want a different vaccination schedule. Why do these groups disregard AAP recommendations about vaccination? A 2011 study suggests it has a lot to do with fear of vaccines’ negative side effects. Some parents worry about the “chemical composition” of vaccines or multiple vaccines being given at once. Some don’t believe vaccines are effective. Others feel the illnesses some vaccines protect against, like influenza or varicella (chickenpox), aren’t that serious. Importantly, though not the focus of this article, the AAP Committee on Bioethics notes that some parents might refuse vaccines due to cost issues or barriers to accessing appropriate health services. Although research overwhelmingly supports the safety and effectiveness of vaccines and indicates that the risk of negative side effects from childhood vaccines is extremely small, many parents still have concerns about vaccine safety. Parents today have access to incredible amounts of information via the internet, which has been shown to significantly affect parents’ vaccine attitudes. 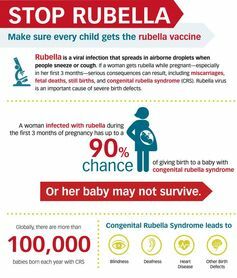 Within this wealth of information about immunization, it can be challenging for parents to separate what’s reliable from what’s not. And, we tend to seek out, pay more attention to, and recall information that we suspect might be true. This is called biased assimilation. So a parent who believes vaccines are dangerous might preferentially register information supporting that view. Vaccine attitudes fall on a continuum. At one end, there are parents who are completely in favor of vaccines, and at the other end are parents who oppose vaccines. In between there is a broad and complex spectrum of parents who are vaccine-hesitant or vaccine-uncertain. The common thread among all parents – no matter their vaccination choices – is that they’re trying to do what they feel is best for their children. 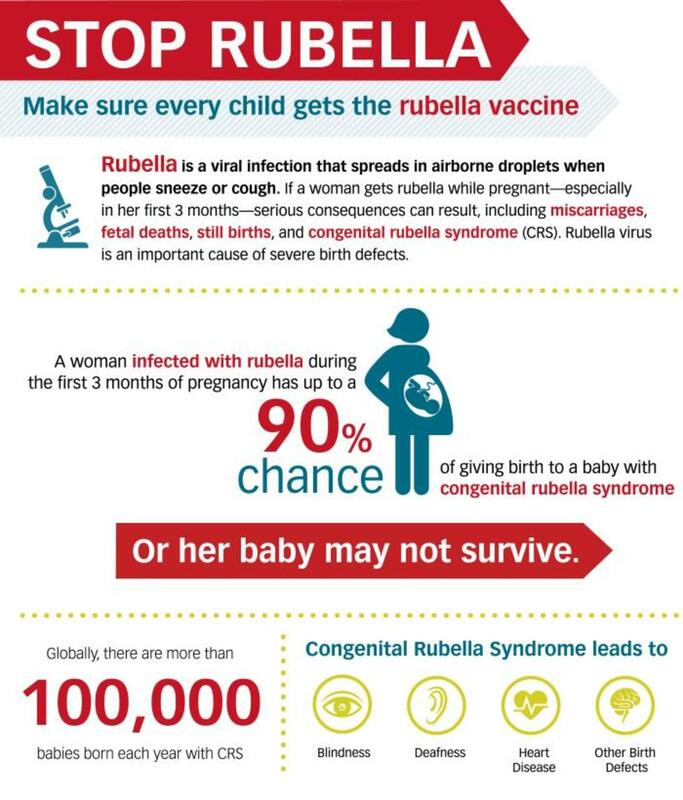 A flyer meant to educate about the rubella virus and benefits of the vaccine. With parents who fall towards the vaccine-opposing end of the spectrum, health-care providers can experience difficulty when trying to change attitudes about vaccines. These parents may have strong feelings and be very confident in what they believe to be true about vaccines. But parents somewhere in the middle of the spectrum, who are hesitant or uncertain about vaccines, are oftentimes less set in their beliefs about vaccination. That’s why some researchers stress the importance of proactive intervention efforts aimed at the very broad group of vaccine-hesitant parents. Parents on this part of the continuum are typically receptive to information about vaccination from trusted health-care providers. Thus, the way nurses and physicians communicate with these parents about vaccination is very important. How should health-care providers talk about vaccines? There is a wealth of research examining communication about vaccines, and researchers are still identifying what methods tend to work well. Communication about vaccination occurs in a variety of ways, from one-on-one conversations with doctors and nurses to large-scale outreach from health departments, such as billboards and radio ads. What can make the provider-parent discussion about childhood vaccination a complex one is that parents’ decisions and attitudes vary, depending, for example, on the type of vaccine. And, in many cases when parents have negative attitudes about vaccines, they’re often based on erroneous information or hearing emotional narrative accounts about adverse reactions from a vaccine. It can also be very challenging for health-care providers to correct people’s misperceptions about risks. There are a few strategies that health-care providers can use when talking about immunization with vaccine-hesitant parents. In clinical settings, although potentially time-consuming in already-short appointments, it’s important to address parents’ specific concerns. Clinicians should discuss vaccines from multiple perspectives, like the benefits of vaccination (preventing illness for oneself and others), as well as the risks of not vaccinating (being susceptible to illness). Research suggests that tailoring the discussion to parents’ concerns can positively affect the provider-parent relationship and foster trust. Since health-care providers can help build public trust in vaccines, communicating accurate information about risks should be part of the conversation. Here, it might be tempting to avoid discussion about the risk of any negative side effects of vaccination, even though the risk is very low. But risk communication is vital. The AAP suggests tailoring the conversation to the parents, understanding and responding to their specific concerns. Physicians should talk to parents about managing common side effects and what to do if a more serious reaction occurs. For some parents, quantifying the risks of vaccinating versus not vaccinating could be helpful. Providing written materials to explain risk is another strategy. It is important to note, however, that more research is needed. Several researchers urge caution about some vaccine communication strategies for fear they may “backfire” and decrease parents’ intentions to vaccinate their children. What about discussing herd immunity? A 2013 study on what influences adults to the get the flu shot suggests people may be more likely to get vaccinated if their peers do it. Among adults, evidence also suggests awareness of herd immunity – or when a critical threshold of individuals is vaccinated so as to make it harder for an illness to spread – can have a positive effect on one’s intention to be vaccinated. Though adults are most concerned about their personal risk of getting sick, they can also be sensitive to the societal benefits of vaccination. However, when it comes to parents deciding whether to vaccinate their children, it may be more important to focus on the direct benefits of immunization for the child. Though mentioning societal benefits of vaccination will likely not hurt. To presume or not presume? In order to increase vaccine uptake among parents for their children, some researchers recommend a “presumptive” approach, which assumes parents are going to vaccinate their children. This is compared to a “participatory” approach in which the health-care provider asks parents about their preferences on vaccination. These investigators question the appropriateness of shared decision making in the context of vaccine decisions. However, other researchers advocate for a “guiding” approach. Here the focus is on addressing vaccine-hesitant parents’ concerns and helping them to understand vaccines’ importance and necessity. It differs from a “directive” approach wherein the provider essentially instructs parents to vaccinate. More research is needed to determine which interventions and ways of communicating information about vaccination are most effective at reducing parents’ vaccine hesitancy and refusal. What is clear from existing research is that respectful, tailored communications and recommendations to immunize coming directly from the health-care provider are associated with increased vaccination uptake. ← NASA Science – Gravity and Alzheimer’s disease – video!